One of the world’s most famous street food dishes is Sicily’s arancini, also known as rice croquettes. Salvo Montalbano treasures the ones made by his cook and housekeeper Adelina. Arancini are made with a base of saffron rice balls stuffed filling, breaded and fried until golden brown to resemble their namesake, small oranges. The saffron rice can be made especially for this recipe or as a way to use up leftover risotto from another meal. The traditional filling is made with a meat ragu that Montalbano says takes Adelina a full two days to prepare all of the ingredients. The real secret in the preparation of her ragu is the whole pieces of meat that break down as it slowly cooks in the sauce. In Palermo and on the western part of Sicily, they are known as arancine, using a feminine name to relate to the small orange shape and color. On the eastern side of Sicily, specifically in Catania they call them arancini, a masculine name for rice balls that are shaped like a small cone to imitate the volcanic shape of Mt. Etna. 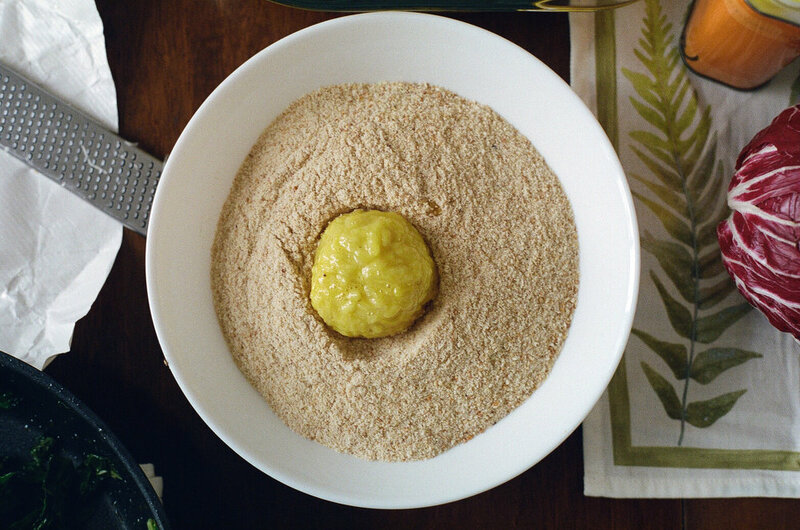 The most common filling for arancini is a tomato-based meat ragu with green peas. Across Sicily, there are many creative options for the filling such as “al burro” with ham and bechamel, spinach and mozzarella, or sometimes even a sweet version with pistachio cream. In this recipe, we chose a less traditional filling of bitter greens with ragusano cheese for a great vegetarian option. Ragusano is an unpasteurized stretched-curd cows milk cheese from a special breed of Modicano cows in the southeast part of Sicily. A substitute for the ragusano cheese in this recipe could be a provolone or caciocavallo. In one of the more famous Detective Montalbano stories, he turns down several invitations for New Year’s dinner in order to ring in the holiday at the home of his housekeeper, Adelina. He even dodges the opportunity to join his fiancée, Livia, for celebrations in Paris. For Montalbano, it’s all about Adelina’s menu – he knows she’ll be serving her famous arancini to celebrate the new year and the recent release of both her sons from prison. As usual, he gets swept away with a case on the night of the party. And in typical fashion, he’s more worried about missing the arancini rather than Adelina’s son’s possible involvement as a suspect in his criminal investigation. 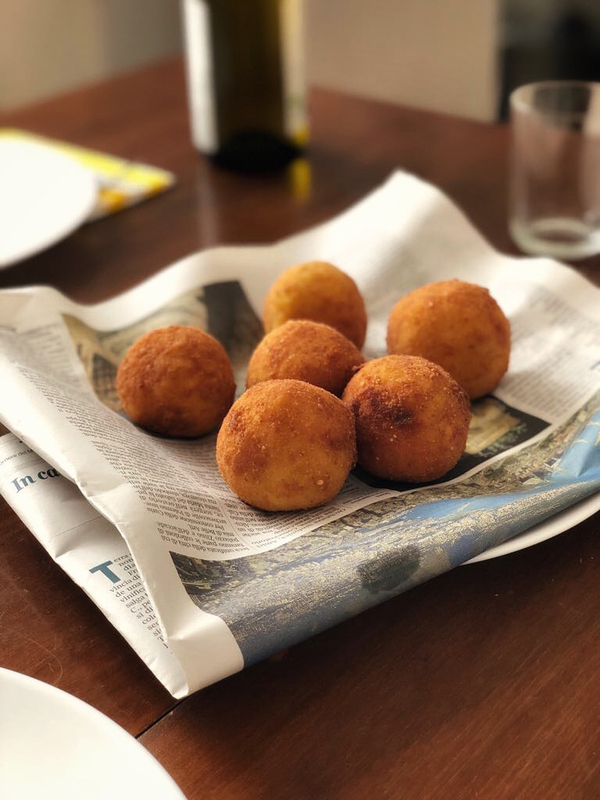 In the end, her son gets off the hook and Montalbano makes it back in time for the New Year’s Eve dinner, starring Adelina’s arancini in all their sumptuous glory. With napkins wrapped around each wondrous creation, everyone at the party eats with their hands and enjoys the juicy ragu filling pouring from Adelina’s legendary rice balls. Linda Sarris is a Greek-American private chef from New York City. After culinary school, she took off for an internship at a farm-to-table cooking school in Italy. She fell in love with the culture, the local food, wine, and Sicily’s magical sunshine. Under her brand, The Cheeky Chef, Linda organizes biannual chef-led food/wine tours and is writing a self-published travel ‘zine called SNACK Sicily. She splits her year between cooking for female entrepreneurs in New York City and freelance travel consulting in Palermo.